Richard Florida published some stats on the distribution of global venture capital investment last week. His work focused on 2012 numbers so the data is a bit dated, but I am sure it is still directionally correct. The bay area numbers are stunning. SF proper and the broader bay area make up 25% of the global venture capital investment activity (~$10bn out of $42bn). SF, Boston, NYC, and LA are the top four (or five if you count SF and the bay area as two different locations). London and Beijing crack the top ten. Ten of the top twenty cities are outside of the US. Berlin, a city that USV invests a lot in, was not in the top twenty in 2012 but I bet it is now. The upshot is this: While some smaller places, mainly in the U.S., do well on a per capita basis, venture capital increasingly flows to large global cities, with all their density and dynamism. The leading centers remain the Bay Area and the Boston-New York-Washington Corridor, while a number of global cities outside of the U.S. have become significant centers for venture capital-backed high-tech startups: London, Paris, and Moscow in Europe; Toronto in Canada; Beijing and Shanghai in China; and Mumbai and Bangalore in India. Across the world, the top 10 metros account for more than half of global venture investment, the top 20 metros account for almost two-thirds, and the top 50 account for more than 90 percent. Ultimately, global venture investment ishighly uneven and spiky, concentrated in a small number of leading cities and metros around the world. 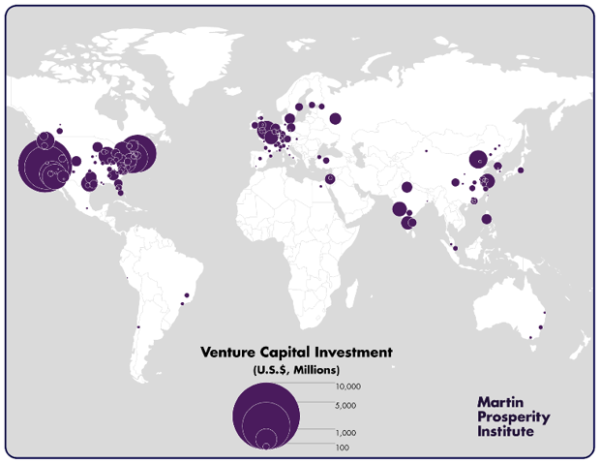 Although venture capital investment has certainly “gone global” by spreading to places like China and India, the dominant centers remain large U.S. cities that combine density, great universities, and the open-mindedness and tolerance required to attract talent from across the world. While cities like Mumbai, Bangalore, Beijing, and Shanghai have certainly shown their ability to attract venture investment and create start-up ecosystems, their levels of venture capital remain well below that of the Bay Area, New York, and Boston. As of yet, these former cities are hamstrung by their inability to attract the world’s top talent. Outside of the U.S., the places that seem to have the brightest future as start-up hubs are dense, diverse, global cities like London, Toronto, and Paris, which can effectively compete for talent on an international scale. This uneven or spiky nature of investment and its flow to great cities marks a broader transition away from sprawling suburban campuses, or “nerdistans.” In recent years, innovation and entrepreneurship have returned to the great global cities and dense, diverse urban areas that have long served as fonts of creativity and invention. What once seemed like a shift toward suburban innovation and startup clusters in the late 20th century has proven to be a brief aberration from the long-held connection between density and innovation. I would add one more thing to Richard’s analysis. Transportation convenience matters a lot. You can fly direct multiple times a day to and from all of the cities on Richard’s top ten list. Investors value their time and focus it on markets that they can get in and out of easily. I think that has a big impact on where money flows. But regardless of the reason, I agree with Richard’s conclusion. VC has gone urban. And I think that trend will continue as far as I can see.